Meet Chloe: Every week, she collects loose change so she can buy tickets to ride the merry-go-round. But one fateful day, she gets lost in the woods on her way home, and a large dragon leaps out from-"Wait! 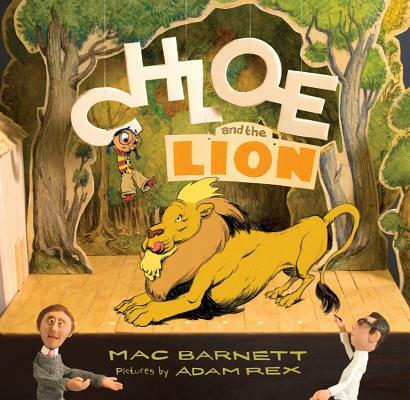 It's supposed to be a lion," says Mac Barnett, the author of this book. But Adam Rex, the illustrator, thinks a dragon would be so much cooler (don't you agree?). Mac's power of the pen is at odds with Adam's brush, and Chloe's story hangs in the balance. Can she help them out of this quandary to be the heroine of her own story? Mac Barnett and Adam Rex are a dynamic duo, and two of the strongest contemporary voices in picture books today. In an accessible and funny way, Chloe and the Lion talks about the creative process and the joys and trials of collaboration. Mac Barnett (www.macbarnett.com) is the author of two books with Disney · Hyperion: Billy Twitters and His Blue Whale Problem and Oh No! (Or How My Science Project Destroyed the World), and the forthcoming Mustache!, Oh No! Not Again!, and How This Book Was Made. He is on the board of 826LA, a nonprofit writing and tutoring center, and a founder of the Echo Park Time Travel Mart, a convenience store for time travelers (seriously). Mac lives in California. Adam Rex (www.adamrex.com) is The New York Times best-selling author and illustrator of Frankenstein Makes A Sandwich. His other books include Pssst!, The True Meaning of Smekday, The Dirty Cowboy (written by Amy Timberlake) and the Lucy Rose series (written by Katy Kelly). He lives in Tucson, Arizona.